Members of Gannon University’s Fraternity and Sorority Life traded in their stitched Greek letter T-shirts for suits, gowns and masquerade masks Saturday for their fourth annual Greek Ball. Each year, the Greek Ball is planned by members of Pi Kappa Alpha fraternity and Alpha Gamma Delta sorority with the intent of raising money for a local charity or nonprofit. This year’s recipient was The Make-A-Wish Foundation of the Greater Pennsylvania and West Virginia area. The event had about 350 attendees and raised around $5,000, which surpassed the $3,000 raised for Shriners Hospital for Children in 2018. The event originated three years ago after the brothers of Pi Kappa Alpha expressed interest in designing an event for each of the 12 chapters to join forces to support a common philanthropy. With financial assistance from their chapter’s alumni, the brothers paired up with the sisters of Alpha Gamma Delta and were able to launch the first Greek Ball event in 2016. According to Amanda Notto, a junior nursing major and a sister of Alpha Gamma Delta sorority, this year’s event planning began in June. The Greek Ball committee, composed of brothers of Pi Kappa Alpha and sisters of Alpha Gamma Delta, began the process by selecting three philanthropies in the Erie community. After a vote, the committee chose The Make-A-Wish Foundation as the recipient and moved forward with planning the event. The Greek Ball is not only beneficial for its recipients, but it also helps the members of Gannon’s five sororities and seven fraternities to promote unity, as well as negate the stigma surrounding Fraternity and Sorority Life. 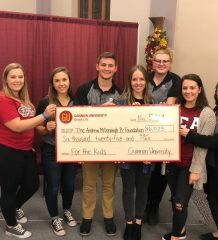 “Sorority and Fraternity Life at Gannon and the Erie community come together to raise money for a local philanthropy,” Notto said. Ariana Aliasso, a senior physician assistant major and a sister of Alpha Sigma Tau, said she thinks that the Greek Ball is a way to celebrate inclusivity and community outreach. 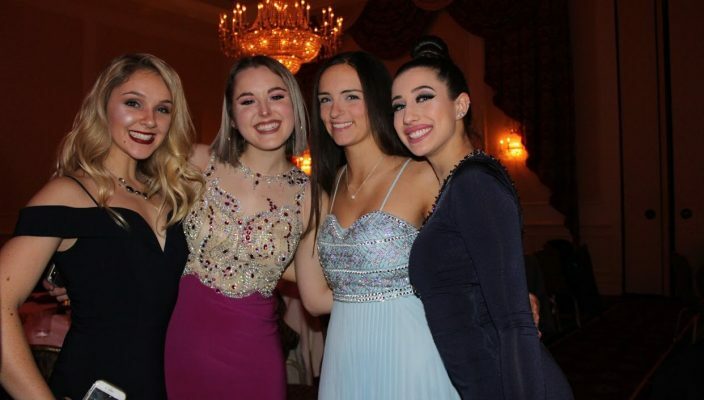 “I think the Greek Ball is a great way for people to support charities while engaging in social activities to promote Greek unity,” Aliasso said. The event, in its title, publicizes the Greek Ball as an exclusive event for fraternity and sorority members, though many often bring nonaffiliated guests. However, Ryan Hamilton, former president of Delta Kappa Epsilon fraternity, has noticed a disconnect between the Greeks and nonaffiliated students. This separation, Hamilton feels, is related to exclusivity within campus events. “Unfortunately, much of the programming on our campus seems to fit along the lines of the Greek and non-Greek paradigm, and the inherent exclusivity of chapters on campus sets natural boundaries between those in Greek Life and those outside it,” Hamilton said. Hamilton suggested that transparency about the issue and encouraging members to attend non-affiliated events hosted by other student organizations would be an effective start to closing the gap. Additionally, he invites other student organizations to attend fraternity and sorority events as well, such as the fraternity and sorority lip-sync and dance competitions in the spring semester. Hamilton hopes that this will provide better understanding across both populations of students and potentially change perceptions of fraternities, sororities and nonaffiliated student communities. Stephen Boylan, a junior and resident assistant in Finegan Hall, is not a member of a fraternity. His opinion of fraternities and sororities pertains to his observation of his residents’ engagement with fraternity events. While the perceptions are often negative, some non-members recognize the benefits of fraternity and sorority life. Rachel Micsky, a sophomore nursing major, is also not affiliated with a sorority, but did go through the recruitment process. “My friends convinced me to go through it and I decided to give it a chance,” she said. “The first night was pretty fun. I got a chance to meet girls from all of the sororities here. “I quickly realized that it was not something that was meant for me. Even though I dropped after the first weekend, I think that it was still a good experience and I am glad that I did it,” Micsky said. Though Micsky decided to see for herself what Gannon’s sororities were like, many non-members form their opinions based on the depictions of fraternities and sororities on television and in movies. This is one of the challenges that Fraternity and Sorority Life faces. According to Anthony DiPasqua, Assistant Director of Greek Life and Campus Engagement, a study showed that 60 percent of college students learned about fraternities and sororities on TV and in movies. The study was conducted by Innova Marketing, a company dedicated to marketing fraternities and sororities. “And because of that portrayal, they’re not interested,” DiPasqua said. “It’s market research that was done through Reddit and actually had a higher response rate than Facebook and Twitter. “But the students are saying that everything they know is from the TV, so I think we need to be telling our true story and not let people tell our story for us,” he said. It is important to the members of fraternities and sororities, especially Aliasso, that the larger community recognizes their contributions of service and philanthropic giving. 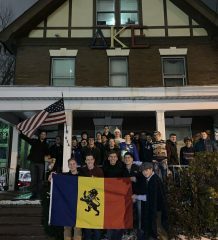 “The movies and TV shows also leave out the academic and service components of fraternity and sorority life, which make up a large portion of Gannon’s Greek organizations,” Aliasso said. It is especially important to her as her experience greatly contrasts the events relating to fraternities and sororities on national news in the past year. According to Time magazine, multiple colleges were brought into the limelight in 2017 as a result of the hazing-related deaths of Maxwell Gruver of Louisiana State University, Andrew Coffey of Florida State University, Matthew Ellis of Texas State University and, closer to home, Timothy Piazza of Penn State University. Incidents on the national news relating to party culture and alcohol consumption greatly affect the stigmas of Fraternity and Sorority Life and in turn affect students’ perceptions of fraternities and sororities on their own campuses. DiPasqua is aware of these opinions and has considered ways to approach conversations with students as they arise. “If they ask a specific question about hazing or other issues, I answer it honestly,” DiPasqua said. “I think that’s one of the problems that’s happening. Communities are saying that hazing doesn’t exist, that there’s not a problem with alcohol, sexual assault is not happening in the community. Aliasso feels that these perceptions make her feel that there is a necessity for her to clarify the kind of person she is when meeting new people. “I find myself having to give an introductory spiel, about how the things seen on the news do not accurately reflect all fraternities and sororities, before I reveal that I am part of a sorority,” she said. Gannon’s administration has in place more intentional policies in place for Fraternity and Sorority Life at the university to prevent any similar incidences. Policies include registering social events, a detailed alcohol policy and risk management requirements. The “Gannon University Anti-Hazing Policy” defines hazing and lists forbidden behaviors. Included on the list are blind-folding, branding, tattooing, confinement, kidnapping, forced consumption of alcohol, servitude and verbal harassment. The document also includes a list of Pennsylvania laws regarding hazing and possible punishments. According to DiPasqua, Pennsylvania laws have changed in response to the aforementioned deaths of four fraternity members. These laws have classified hazing as a felony and have established new guidelines on hazing. “I think it’s good for schools to be held to a higher standard when it comes to issues related to hazing,” DiPasqua said. “It forces us to adapt and engage our communities to understand why the law was enacted and help them understand what it actually is. “One of the challenges is that organizations get caught up in tradition and some can be considered hazing, so it comes down to identifying those behaviors and educating members to realize that some traditions should be changed,” he said. Some of the new pieces of legislation have gone into effect while other pieces have a Jan. 15 deadline. As a result, DiPasqua plans to implement a stronger program for educating current and new members on the classifications of hazing. One national problem in regard to hazing is that there is not a standard, nation-wide legal consistency. Across the U.S., states are responsible for passing their own laws on the matter. As a result, some states take the issue less seriously than others. At a professional development opportunity, DiPasqua recently heard the families of some of the brothers who lost their lives speak at a professional development opportunity. These families have joined forces to create a nonprofit dedicated to ending hazing and encouraging all 50 states to make it a felony by articulating the severity of the issue and sharing their sons’ stories. “It’s also crucial that we are engaging actively with the changing legislation and the other fraternity and sorority advisers in the region,” DiPasqua said. “It’s important for us to understand what conversations other schools are having on their campuses and how we can create opportunities to partner together to encourage cross-university conversations about hazing. Though there are many actions and policies in place to prevent hazing within Gannon Fraternity and Sorority Life, the community faces the reality of related stereotypes and stigmas. Kennedy Walters, a junior who is double-majoring in psychology and criminal justice and current president of Panhellenic Council, believes it is the responsibility of Gannon’s members of fraternities and sororities to look out for one another. Walters considered both sides of the argument when she heard of the outcry to exterminate fraternities and sororities as a response to the 2017 hazing crimes. “From the outside looking in, getting rid of Greek Life as a whole may seem to be the only way to stop these incidents,” she said. The Interfraternity and Panhellenic Councils are composed of fraternity and sorority members who oversee the chapters and are responsible for ensuring the upholding of national and university policies. One way in which these executive councils have worked to diminish the negative connotations surrounding fraternities and sororities is to recreate the language of the communities. For example, the terms “Greek Life” and “pledge” are now considered outdated terms, and the community prefers the uses of “Fraternity and Sorority Life” and “new member” in their places, as recommended by DiPasqua. “Changing the name was a decision made to reflect best practices in the field as well as promote cultural competence,” DiPasqua said. “‘Greek’ refers to an ancestral heritage. ‘Fraternity and Sorority’ better encompasses the chapters and helps students understand who we are. “‘Pledge’ and ‘rush’ have negative undertones from the history of social lettered-organizations. Using terms like ‘new member’ and ‘recruitment’ [in place of “rushing”] reflects the positive experience we strive to provide while breaking from the negative past. “‘New member’ rather than ‘pledge’ also breaks down barriers and helps equalize how members are viewed and treated within the organization,” DiPasqua said. Though the change in terminology has been difficult for members to consciously adopt into daily use, many members of the community, including Hamilton, agree that the changes are a necessary element of shifting attitudes. “I think the words we use have power, and changing the colloquialisms of our community’s vocabulary throughout the changing times is a good way to shift our culture,” Hamilton said. Hamilton hopes that the changes in terminology will turn the overall attention on the community away from the national stigma and toward the local service contributions of the chapters. Aliasso also values opportunity for service events in the neighborhoods that surround the Gannon campus. “I want people in the Erie community to know that we are always looking for more ways to get involved and give back. I want them to know that we don’t fit the typical stereotype of Greek Life,” Aliasso said. Micsky, having met many members of the sororities on campus, recognizes the chapters’ dedication. Aliasso is grateful that others appreciate their efforts. Aliasso is referring to the First Presbyterian Church of the Covenant, which allows students to study at the Church from 9 p.m. to 8 a.m. each night during the week of final exams every semester. Students must show their IDs to enter the church, so many members of Fraternity and Sorority Life volunteer to sign students in and others donate snacks and beverages. Along with service, fraternity and sorority members are involved with leadership development, attending national conferences at which they explored their leadership styles, skills and methods. Twelve members from their community will be attending the National Greek Leadership Conference in Connecticut during the spring semester. From the conference, six of those students will be flying to Jamaica for an Alternative Break Service Trip (ABST), led by Hamilton and Aliasso. While there, the students will be serving the community of Petersfield, helping in educational programs in schools, as well as public works projects, according to Hamilton.